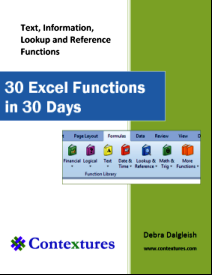 Free Excel workbooks that you can download, to see how functions, macros, and other features work. Some files contain VBA code, so enable macros if you want to test those. DV0074 -Drop Down Shows Visible Items Only - In employee list, add X in rows where person is on vacation. Filter the list to hide the X rows. Data validation drop down shows available employees only. DV0073 -Data Validation Combobox - Select Next Item-- Click a button on the worksheet, and a macro runs, to select the next item in the Combobox list. If the last item is currently selected, the next selection is the first item in the list. DV0072 -Data Validation Combobox - Add/Sort -- Click a cell that contains a data validation list, and a combobox appears -- font size can be set, more than 8 rows displayed, autocomplete can be enabled. If a new item is entered, you will be asked if you want to add it to the existing list. Similar to DV0062, but lists with multiple columns will be sorted correctly. Enter production time, then select hour and minutes for defect time. Must not be greater than production time, and drop down lists control the valid times. Click the option button for a region, and the data validation drop down shows list of colors for the selected region. . List project tasks, estimated time, person assigned, date completed, actual time, and other task information. Summarize task data in pivot tables, to see total times. Click a cell that contains a data validation list, and an ActiveX text box appears on the worksheet. It can show a long message about the cell's data validation. Use the scroll bars, if necessary, to see more of the message. Click a cell that contains a data validation list, and a form appears. Click items in the ListBox, or type in the ComboBox and click Add. Then, click OK, to add all selected items to the cell. Lookup lists are in named ranges on different sheet. Type one or more letters in column B. Then, click the cell to the right, that contains a data validation list, and the drop down list will only show the product names that contain the letters you typed. Click a cell that contains a data validation list, and a combobox appears -- font size can be set, more than 8 rows displayed, autocomplete can be enabled. Lookup lists are in named ranges on different sheet. Select a region from the first dropdown list, and dependent cell's validation list shows only customers in that region. Customer cell is cleared when Region is selected, to prevent invalid Customer names. If a list contains blank cells, the usual formula for creating a dynamic named range does not work. Use formulas to create a second list, without the blanks, and base the dynamic range on that. DV0029 - Dependent Cell Examples-- Two samples of code altering dependent cells. Source lists on separate sheet. DV0022 - Update Validation Selections -- If you change an item in a data validation source list, the worksheet may show previously selected items. Event code can update the worksheet when you update the source list. After applying filters to an Excel Table, click the Clear Next Filter button to clear the filters one at a time, from right to left. Click the Reset button to set the Clear Next column number back to its original column count. Use Slicers to select criteria for an Advanced Filter. Slicers are connected to a pivot table that is based on the source data. In the extract range, select the headings for the fields that you want in the output. To make it easier to reapply filters, you can save settings in a Custom View. Show the selected view's name on the main sheet, based on a list of view names..
With this technique from AlexJ, you can use Slicers with a formatted table in Excel 2010. Click a worksheet button, and a macro captures the current date and time, name entered on worksheet, and number from button. Enter quantity, and button text changes, based on lookup table. If 41 or over, caption "See Discounted Price", ShowPriceDisc runs. Different caption and macro for 40 or below. Show a personalized error message with user name from network or application, when budget total is above the limit. Enter a folder path in the green cell, then click the button. Macro adds new sheet to workbook, with list of subfolders in the main folder, and file counts for all folders. NOTE: Before you unzip the folder, unblock the zipped file. Click a main sheet tab to show its related sheets, and hide other sheets. Click button to open the input form. Type single-digit score, and next hole's box is automatically selected. Click OK to add scores to worksheet. Enter company name and number of passes in table one, and a row for each pass is added in table two. Popup list of sheets in the active workbook. Sort by sheet order or alphabetical order. Click a sheet name to go to that sheet. This UserForm is modeless, so leave it open while you work in Excel. In a filtered table, select cells in one or more rows, then run the macro. The entire row for each selection is copied, and pasted at the end of the table, or pasted below the last row in the selection. Hidden rows are not copied, just the visible rows. NOTE: If columns are also hidden, the data will not be pasted correctly - unhide columns before using this macro. Select a sheet type from the drop down list, and only sheets with matching tab colour are visible. Choose (All) to see all the worksheets. Select a sheet type from the drop down list, and only sheets with that text in their name are visible. Choose ALL to see all the worksheets. To make it easier to insert rows on a worksheet, use a macro. This file has an Admin sheet, where a formatted heading section (3 rows) is stored. To insert a section heading on the Data Entry sheet, select a cell in the row where the new section should start. Then, click the button, and confirm that you want to insert the heading. The Data Entry sheet is protected, and the code unprotects, then reprotects the sheet. Instead of putting macro buttons in a frozen section at the top of a worksheet, put them in a UserForm. With Worksheet_Open code, the form will open automatically when the file opens. The ShowModal setting is False, so the form can stay open while you edit the worksheet. Position the form anywhere on the screen, so it is easy to access while you work, or during a presentation. Click a numbered square and a macro reveals a Christmas picture each day. There is a simple formula on each window, instead of a number -- create your own formulas, or change to numbers, if you prefer. Enter a folder path and name, then click the button to create a list of all files, and their properties. Or, click button to create a list of properties and their names. To ensure that the first four rows in a table print at a consistent size, a Workbook_BeforePrint macro increases the font size, if necessary, based on the zoom level. After printing, the font size is reset.. Select a category from one combo box, list of related products appear in the dependent combo box. Product combo box is cleared when a different category is selected. 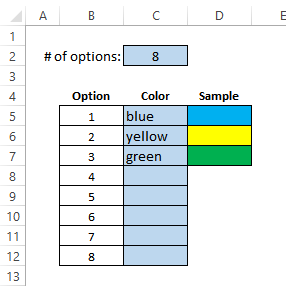 Double-click a cell with conditional formatting colour, to copy that colour to adjacent cell, and show the RGB numbers. Or, run macro for colour info in message. Simple Advent Calendar uses background picture, formulas and conditional formatting to show a different picture each day, from December 1 to 24. Simple Advent Calendar uses formulas and conditional formatting to show a different picture each day, from December 1 to 25. Click Spin Button to change eye colour in skull, and see worksheet message. Click check box to see scary or friendly pumpkin picture. Formulas change messages, no macros. Highlight expiry dates that are in 30 days or less. Summary sheet shows total item count, and count of items expiring soon. Interactive card uses data validation and conditional formatting to colour cells in the shape of a heart. Also contains heart-shaped creature cards, made from Excel shapes. 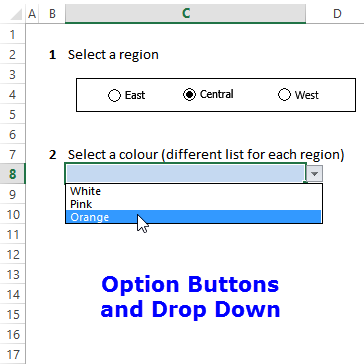 Select a color name from a drop down list, adjacent cell shows the selected color. Data validation and conditional formatting are used in this technique. CH0012 - Seating Plan -- Select guest names from drop down list, names appear at selected table in seating plan. Based on data validation and donut charts. CH0011 - Chart Colour Based on Rank -- Macro changes the pie chart and bar chart colours, based on number in Rank column. Slice size and bar length are based on Order amount, colours are based on ranking of percentage invoiced. CH0002 - Show or Hide Chart -- Using named ranges and a linked picture, show or hide a chart based on the selection from a drop down list. Instructions and Video. PT0047 - Budget Report Selector -- Enter Forecast and Actual data for a budget, see the summary in a pivot table. Click the Slicer to change values in the Pivot Table report - choose the forecast, actual, YTD, Variance or Variance Percent. PT0046 - Analyze Food Tracker Data in Excel -- Export data from the LoseIt app, and paste into this workbook. Pivot tables summarize the data. PT0045 - Hide Subtotals for Single Items -- Hide subtotals for sections with only one item, in simple pivot table. Conditional formatting rules check for "Total" in column B, and different data in row above. Custom pivot style adds border after each category. PT0044 - List Pivot Fields and Pivot Items -- Adds sheet with list of all row, column, and report filter fields, and their items. Visible items are marked "Y". Select cell in pivot table, before running macro. You will be prompted for maximum number of items per field to list without confirming. PT0043 - Track and Summarize Activities -- Record daily activities and summarize in a monthly report. Sample shows student and parent activities at a school. Same technique could be used for business activities. PT0042 - Results from Pivot Table Survey -- Pivot tables summarize data from the Pivot Table Survey on my Contextures Blog, August 2015. PT0041 - Show Survey Results in Pivot Table -- Pivot tables summarize data from the Excel Version Survey on my Contextures Blog, July 2015. PT0040 - Show Filtered Data Percent of Grand Total -- Pivot table on hidden sheet shows all data. Pivot table on main sheet is filtered. Summary table uses GetPivotData formula to show filtered data as % of grand total. PT0039 - Copy Source Data Number Formatting -- Select a cell in a pivot table and click button to run macro. Number formatting from source data is applied to all fields in the Values area. PT0038 - Change Report Filters With Cell Dropdown Same Sheet -- Select an item from a data validation dropdown, and all pivot tables on that worksheet show that selection in the page field. Excel 2002 and later versions. In a pivot table, group dates by year and month, to create a chart that compares data year over year. PT0036 - Show Text in Pivot Table Values Area -- Use conditional formatting and custom number formats to show text instead of numbers, in pivot table value area. PT0027 - Change All Page Fields - All Sheets or Active Sheet -- This sample file has 3 variations on the "Change All Page Fields" code, which also changes the "Multiple Item Selection" settings to match changed page fields. For Excel 2007 and Excel 2010 only. 1) Change any page field in a pivot table, and all matching page fields, on all sheets, are changed. 2) Change any page field in a pivot table, and all matching page fields, on the active sheet only, are changed. FN0061 - Show Text and Buttons in Selected Language -- Select English or French from drop down list, and workbook text, buttons, and messages show that language. Numbered notes link to lookup table. Use the IF function or conditional formatting with a custom number format, to show your own custom hash errors in Excel. If amount is over budget, cell shows #OVER! Press F9 to select random items from 3 lists, to create a scenario. Third list depends on selection in first list. Use the LEN, TRIM and SUBSTITUTE functions to calculate how many items are in a cell, separated by commas or space characters. Or, check that at least 3 items are in a cell, such as a street address, "123 Maple St". Try this lookup formula challenge from Contextures Excel Newsletter 20171017. Create a formula in column E, to get the correct customer code for each record in the imported data. There are hints to help you, and solutions on a different sheet. Select a courier name and country from drop down lists. Weights and rates for those selections are shown in the table. Uses INDIRECT and INDEX functions to pull data from named ranges. A summary of the favourite Excel functions mentioned in Jon Wittwer's survey of Excel experts. List of functions, and pivot table summary of the counts. Product pricing table has a list of price changes, with dates. Invoice table pulls the applicable product price, based on selected product and invoice date. Enter a list of holiday weeks, regular pickup day, and the type of waste that is collected each week, then print the schedule. Count specific codes in a range of cells, where some cells contain multiple codes. For example, count "JK" only where another code is "JKA". Select a language from the drop down list, and the TEXT function uses the correct code to show the weekday name -- "ddd" for English and "jjj" for French.. The RAND function is used to produce sets of 3 unique Bingo cards in this Excel template. The CHAR function converts the number to a characters, and the Webdings font is used on the bingo cards, to show the selected characters as pictures. Based on the original Bingo cards file below, that uses numbers. Create a list of worksheet names in a workbook. Then add HYPERLINK formulas to each sheet, to navigate to the next or previous sheet. No macros required -- the formulas do all the work. Enter project start date, and number of days, and formula calculates the end date. Specify the weekdays that are non-working, and list the non-working holidays. For Excel 2010 or later. Keep track of your daily activity, and see the running total of days, and minutes of activity. Use the INDEX and MATCH function to find product prices from 3 supplier lists. Highlight lowest price and show supplier name. Use the CHOOSE function to assign a score for each option number. Press F9 to select random items from 3 lists, to create a scenario. Could be used to select names for groups, or protein and side dishes for a meal. Uses INDEX, RANDBETWEEN and COUNTA functions. Select options in the survey, and see a score for each option. Keep track of your lecture hours, and course work hours, to see what the weekly totals are. Use SUMIFS and COUNTIFS to count hotel guests who stayed during a specific date range. Use CHOOSE with RANDBETWEEN to create random text in a sample file, to use for testing.. Enter variables such as URL, height and width, then copy IFRAME code to your web page. FN0009 - Print Unmarked Invoices -- uses VLookup to create an invoice; a macro prints unmarked items from the list, and marks as printed. Also see the Bingo cards with pictures above. 2016-Jul - 28: After a recent Microsoft update, downloaded files might not work correctly, unless you unblock them, or store them in a Trusted Location. Add a check mark in the Unblock box, near the bottom of the Properties window. Click OK, to close the Properties window. These sample Excel templates are provided "as is" for the sole purpose of illustrating Excel techniques. 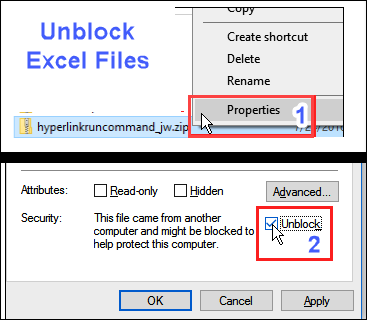 The authors do not warrant that the example Excel templates will meet your requirements or that the operation of the example Excel templates will be error free.